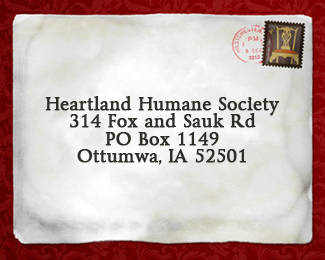 The Heartland Humane Society began in 1994 as a small group of individuals convened to address the lack of options available for the large numbers of unwanted animals in the community. Under the direction of founder, Jean Sporer, a board of trustees was established and a network set up to develop, foster, and adoption opportunities. Incorporation came the following year, and by 1996, we opened our first shelter, housed in a former pet store and located along the highway between Ottumwa and Agency. As a non-profit, no-kill shelter, our funs were limited to adoption fees, fundraisers and private donations. This financial status remains in place today, as no federal, state, or local agency provides funding on a regular basis. We have added the pursuit of grant monies and occasionally enjoy the receipt of these much appreciated funds. We soon outgrew the first building, and were forced to seek larger quarters for the expanding numbers of dogs and cats coming in locally as well as from surrounding communities. Through the benevolence of a dear friend, we were able to purchase our present building on Fox and Sauk Road in Ottumwa in 2003…. a former sanitation building which still presents a challenge in the efforts required to convert it to a shelter for animals. As we were able, a staff of paid workers and management was added to the volunteer crew, and the scope of the operation grew to include educational outreach in the schools, pet therapy sessions in the hospital and local residential facilities, Spay/Neuter programs, shelter animal outings at various community functions, public information outreach via radio and TV broadcasts, a quarterly newsletter, and the list keeps growing. IN 2009, we were thrilled to become part of the Rescue Waggin’ Program sponsored by Petsmart Charities, in which dogs found eligible through extensive evaluation and screening, are transported to shelters in other northern Midwestern states, where there is a low population of adoptable dogs. This arrangement allows source shelters like Heartland, to keep openings for the steady stream of dogs in our area still without homes, and assures a large number of dogs a ready adoption on the other end. To date, we have sent hundreds of dogs to new homes and new lives. Our board of trustees is an active mix of passionate and dedicated individuals who work hard to further the mission and operation of the shelter and its related disciplines. We are always in pursuit of others able and willing to accept the calling to work and advocate for our shelter animals.